What is it about growing tomatoes that so captivates people? Is it a Macho or Macha thing? For whatever reason, throngs of gardeners everywhere are possessed with the idea of growing tomatoes. Maybe it's an annual rite of passage. One thing's for sure, people grow so many tomatoes they can't use them all. That's why we don't grow tomatoes. We didn't grow the tomatoes in the photo above. Nope, they were given to us but people who grow them. 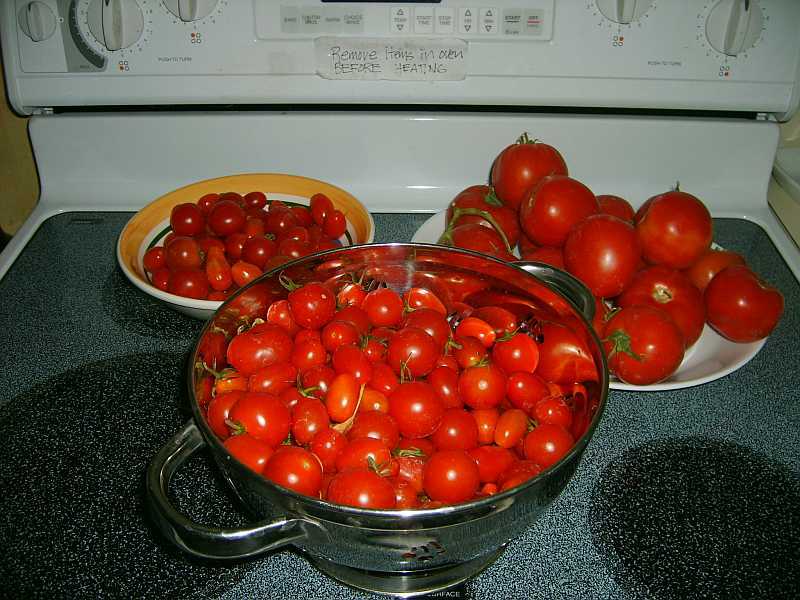 It happens every year--an overabundance of tomatoes. 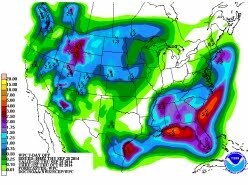 We simply sit back and wait and, pretty soon a Tomato Tsunami shows up on our arms and on our doorsteps. It's awesome and we didn't have to fight the hornworms and all the other pests that bother tomato plants. How could it get any better than that? Each year this delightful circumstance always reminds us of our two summers in Gold Beach, Oregon, where the Rogue River meets the Pacific Ocean. 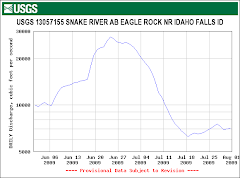 That area is famous for its chinook salmon fishing. We camped in an RV park up on the Rogue that was mostly populated by addicted salmon fishermen. You know an addicted fisherman when you see one because they have invested umpteen tens of thousands of dollars in gear to catch fish that usually sell for about $8 a pound. They spend entire days and days and days waiting for those big fish to decide to bite their lure. Well, by and by, most of the addicted fishermen catch giant salmon. These salmon are usually so big they don't even fit a 150 quart cooler. So, the moral of the story is that these fisherman gave us umpteen pounds of fresh salmon to eat. When those same fishermen returned the following weekend, they would usually heap smoked and canned salmon on us, too. We ate so much salmon those summers that I can hardly stomach the stuff even this many years later. I had a lifetime "fill" of salmon and it wn't bother me if I don't ever taste the stuff again. It's not quite that bad with local tomatoes but it's close. I mean who many fresh tomatoes can you eat anyway? We try to east as many as we can but we often have to give away the tomatoes that have been given to us. It's kind of like a hot potato game only with tomatoes instead. Meanwhile, down at yonder Farmers Market, Showmaker's STILL doesn't have any new crop pinto beans in stock. There's only two weeks left for them to show up. 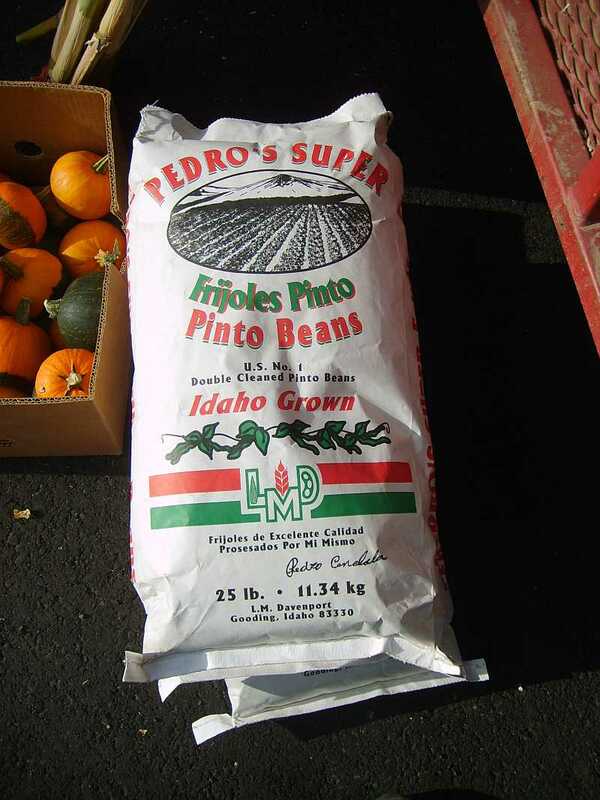 The photo shows a bag of the 2009 crop beans from Gooding, Idaho. We're gettin' real antsy for some fresh new crop pintos. Come ON, Pedro! 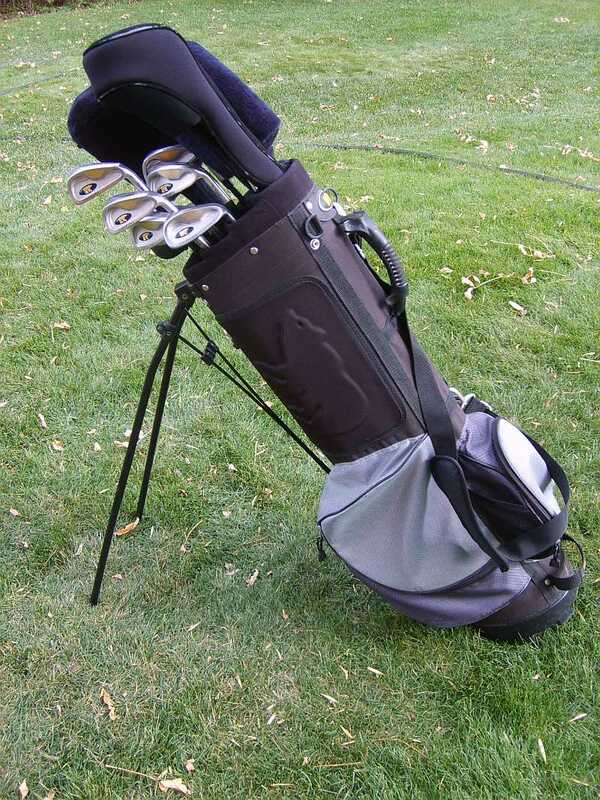 And, finally, we just sold a set of gold clubs with a bag for $40 on Craig's List. Here's how it came to pass. I got a chance to buy two matching golf bags with rain covers yesterday. One bag had a pristine set of right-handed Dunlap clubs and the other bag had a pristine set of Jack Nicklaus graphite shaft clubs. Well, the goal was to wind up with two matching bags. So, I gave Susun teh right-handed oversize Dunlaps and then put the Nicklaus clubs in the Nicklaus bag I found last week. Then I added some driver covers and a putter and popped it onto Craigs List and, BAM, as Emeril would say, they were outta here. The buyer didn't even haggle on teh price, he just peeled off two twenties and hot-footed it out of here. So, what does that $40 mean? It means that all of Susun's clubs and gear are essentially free and we now also have two matching bags. Man, ya gotta love them t-stores! I remain disturbed by this golf thing. Thank god Beaver Creek's course is history as I KNOW you won't set foot on Verde Santa Fake's course. Go get some FRESH mozarella, the real kind, little balls packed in water. NOT the dry mozarella. FRESH. Halve all the little cheese balls, then halve a lot of those cherry tomatoes. Put the tomatoes and cheese in a big bowl. Julienne a whole bunch of fresh basil and sprinkle it onto the tomatoes and cheese. Kosher salt, fresh ground black pepper, Xtra Virgin olive oil and balsamic vinegar. Toss well. Split a crusty french baguette in half and smear it with the same oil and rub it with a mashed garlic clove. Toast it in that Turko thing. Eat the salad on the crusty toasted garlic bread. You will feel the wool lifted from your eyes, especially with a glass of Carlo Rossi Paisano. 10 bucks a gallon. Almost free. yum!!! i like all the different shades of red! !